What does it take to revise a cold, hard science fact? This monthâ€™s Sparks podcast explores that question in the context of â€œThe Hunt for Vulcanâ€� by Thomas Levenson. Entomologist Justin Schmidt is developing a way to measure painful insect stings - by stinging himself with as many creatures as possible. Ben Lindbergh describes what happened when a professional baseball team let him take over as general manager and apply the most cutting edge analytics to real games. WTP presents a data murder mystery, reported by Joel Werner. A geospatial mapping formula may hold the clues to the graffiti artist Banksy's real identity. New developments in the story of the fraudulent research about persuasion and empathy. Visit fivethirtyeight.com/podcasts for more. Christopher Ingraham used a data sat to determine "the worst place to live in America." Then he visited Red Lake Falls, MN; and now he's moving there. Doug Rushkoff is one of our favorite media/tech thinkers. His new book is about how our economy is wired for growth that stifles innovation. Every week for a year, Stefanie and Giorgia collected info about their lives and mailed each other postcards with a data visualization. Now it's your turn! More on our site. In countries like Yemen, cell phone metadata can serve as an end-around to paint a picture of daily life, the effect of drone strikes, and more. Walt Hickey's been trying to crack the tricky data problem that is the Oscars. He talks about his reporting, and we host the first ever WTP data debate. A visit to the Westminster Kennel Club Dog Show with Oliver Roeder, who wrote about the rise and fall of the terrier dynasty. We've been screwing up in the way we talk about privacy on the show. Kashmir Hill of Fusion sets us straight. As you watch the Super Bowl this weekend, tons of data -- and millions of dollars -- will be zipping around. Jim Glanz of the New York Times discusses his reporting. In Flint, Michigan, bad data decisions made the water crisis much worse. FiveThirtyEight's Anna Barry-Jester recently reported on the story. Obama 2008 to the present, including reporting from Iowa. With Daniel Kreiss of UNC. William Jennings Bryan to Barack Obama. With Daniel Kreiss of the University of North Carolina. A visit to a data-driven farm, where the light, water, nutrients and more are all optimized and controlled from an iPad. Let us know what you think of our elections podcast as we continue to pilot. We'll launch the show formally in a new feed before the Iowa caucus. More of the most interesting stories and people of the year. Be sure to check out the special site fivethirtyeight.com/dataawards. We'll be back with new shows in 2016! 538 is launching a proper election pod in January. For now, we're piloting with Nate Silver, Clare Malone, Harry Enten and Jody Avirgan. Let us know what you think. A very special evening, brought to you by FiveThirtyEight. 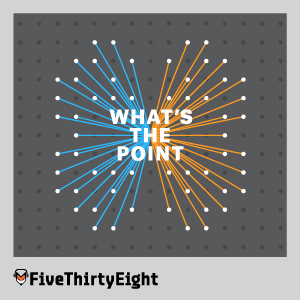 538 is launching an election podcast in January! We're piloting now with Nate Silver, Harry Enten, Clare Malone, and Jody Avirgan. Take a listen, let us know what you think. Forensic evidence has the promise of leading to science-based convictions. But for it to be reliable we need a better understanding of data and statistics, says Erin Murphy. The Good Dinosaur features vast, hyperrealistic landscapes -- powered by terabytes and terabytes of US Geological Survey data. Religion is personal, nuanced, evolving -- which makes it particularly resistant to easy quantification. Emma Green (Atlantic) and Leah Libresco (538) discuss stats and faith. Turns out, the Canadian census was a pretty big flashpoint in the recent elections, and the fight over it tells us a lot about why government data matters. In a country like Niger, Doctors Without Borders epidemiologists use a combination of advanced technology and old-fashioned paperwork. In 1970's NYC, huge swaths of the city were engulfed in flames. Bad stats may have been to blame. Joe Flood, author of "The Fires," tells the story. Walt Hickey recently discovered that Fandango's movie ratings are weirdly inflated. What he learned says a lot about trust online and the wisdom of the crowd. We take a hike in the woods north of Santa Cruz in search of the marbled murrelet, an elusive bird that's being tracked using remote sensors and machine learning. Tweet tweet. A tour of the Bloomberg terminal -- it's clunky, powerful, addictive and ubiquitous on Wall Street. It also costs $2000/month and has everything a trader could need. Nate Silver, Harry Enten and Micah Cohen talk about the 2016 election as part of an Advertising Week panel. Stay tuned for the FiveThirtyEight Politics channel coming soon! Your data creates its own data. Farai Chideya discusses how she thinks of data, security, and why your information is like your pet -- you own it, but you can't control it. A.J. Jacobs is trying to build the world's biggest family tree, connecting him to everyone on earth. The data-driven revolution genealogy is helping. Josh Lynn says his "consumer engagement" algorithm can predict how a movie will do - months before it's even made. A special co-podcast with Grantland's Andy Greenwald. From Amazon to UPS, the data-driven workplace is here. Is your humanity being traded for your company's efficiency? The people behind @buzzfeed and @nba discuss how analytics help them decide what to post and when, plus the behind-the-scenes story of how Buzzfeed got that dress to go viral. After a deluge of retractions, fraudsters, and high-profile failures, is it time to ask: "Is science broken?" FiveThirtyEight's Christie Aschwanden answers. Our military collects terabytes and terabytes of data every day. Is the drone-driven obsession with tactical information preventing a conversation about the morality of war? It's been a year of protest and unrest -- and a year of data collection -- in the effort to understand the scope of police violence in America. New tools use data to predict whether someone who has committed a crime may do so again. Does this mean we'll be locking people up for crimes they haven't yet committed? FiveThirtyEight's latest "totally subjective odds," where we handicap the (very early) presidential race. Featuring Nate Silver, Harry Enten, and Katherine Miller of Buzzfeed. Journalist and internet activist Quinn Norton discusses the cookies and algorithms that track you online -- including on FiveThirtyEight.com -- and how they shape identity. The head of one of the world's biggest book publishers talks about how data is changing the industry, from deciding to sign an author to the war with Amazon. Dr. James Hamblin, writer for The Atlantic, discusses how big (and bad) data will affect your next visit to the doctor. In the first audio version of our popular (and statsy) "Dear Mona"€� column, Mona Chalabi and Jody Avirgan investigate how many folks have tattoos and people's tattoo regrets. During Janette Sadik-Khan's tenure as NYC transportation commissioner, the city's streetscape altered dramatically. She discusses her data-driven (and controversial) approach. Star Talk's Neil deGrasse Tyson on how data is revolutionizing astronomy, why he hates "balance," and why his being black often leads people to confuse him for a sportscaster. From fake studies to bad polling to privacy fears, is data in a moment of crisis? We launch our newest podcast with a discussion about the state of big data, and some of the major themes we hope to explore.